The Bard’s Tale has an unusual history. The first game, released in 1985, wasn’t even called a Bards Tale for a start but Tales of the Unknown: A Bard Tale. I guess when they commissioned the sequel they accidentally removed the main name rather then the subtitle and the rest is history. Right up until 1988 when the series all but disappeared for a decade or two. After a reboot of the series in 2004, we’re finally back with a new game thanks to the Kickstarter crowdfunding campaign that delivered $1,519,680 in pledges to developer inXile Entertainment. Set a couple hundred years after the events of The Bard’s Tale III, because three decades is a couple hundred years in the games industry, you’ll get to experience a revitalized system of the 80s turn-based combat. With up to six party members, you’ll use spells, swords and positioning on an eight by two grid to overcome your opponents who will be doing the same. It’s a little unusual by today’s standards but remarkably easy to understand as soon as you see it. At its heart, The Bard’s Tale IV is a turn-based system with a lot of recognisable mechanics like staggering enemy attacks and the assortment of skills and abilities you can use. But that being said, there’s something decidedly different about the presentation of it all. The original game was acclaimed for its sort of animated character portraits, and the game is clearly focusing on those. The presentation I was shown at Gamescom was also a little unusual. The setting is the very pinnacle of high fantasy with an assorted collection of beasts and ghoulies to fight, and elves and dwarves to talk to. I was told the game was a bit serious, which you can understand when it opens with several hangings, but it felt decidedly light-hearted after that point. During the class selection screen, there’s an animation for each one, with the thief almost making me laugh out loud as he hides, hides behind the menu. Later on in the demo, we encounter a strange monster for had “one of everything” according to the developer present. It had one eye, one leg and one hand, and limbed across the abandoned city street on both of them. But besides a couple tonal inconsistencies, The Bard’s Tale IV has a really strong identity, and truly draws from its own past. The opening scene, for instance, is an animated version of the original game’s logo. It proudly wears its past on its sleeve and blends it well into a good-looking, Unreal Engine 4 powered modern existence. While a lot of the original fans might have moved on, the developers know where they are coming from. At the end of the presentation, one of the developers said offhand that “We didn’t want to think about this being a sequel to a game from three decades ago. We wanted to imagine what it would look like if the franchise kept going the whole time.” It’s probably the perfect way to describe the feeling of the game. 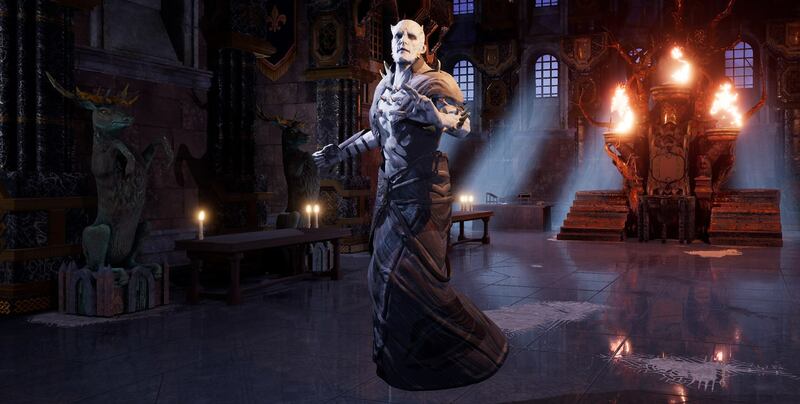 The Bard’s Tale IV is its own and it feels like a Bard’s Tale game should. Perhaps, had the series continued unabated from its origins, the game might have taken more inspiration from its companions in the genre, but as it stands it’s like it evolved in isolation, and is even more interesting and unique to explore as a result. The dungeon crawler developed by inXile Entertainment will be available on September 18th for Windows PC. The Bard’s Tale IV is also expected to hit Mac, Linux, PlayStation 4 and Xbox One later this year.